Oh, I wonder if there is anyone even out there reading this little blog anymore. I wouldn't blame you if you weren't, since I have been so bad about keeping up with it. I will say I've been a little better at giving updates about my classroom using Instagram. So if you use Instagram and like to see little bits and pieces here or there, I'd love if you'd follow me on that journey. I am also hoping to find a little more time to spend on Facebook so you can check me out there as well. Speaking of Facebook, I just finished my first Facebook Freebie Hop with a bunch of other amazing first grade teachers and it was awesome! I have to say I was truly amazed and honored at the response that we got from the freebie hop. It's one of the reasons that I want to spend more time on my Facebook page because it seems like an easy way to check in each day. What's that? You missed it? Well . . . because of the overwhelming response - I've decided to put my freebie on here as a thank you to anyone who is still stopping by to see what's going on in my world or even to those of you who have just stopped by for a visit. I hope you are able to find a use for it. I will link it up at the bottom of this post. 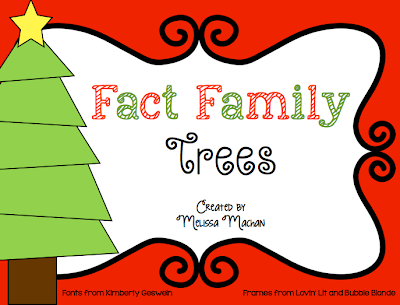 This freebie will only be free for a little while and then it will be for sale in my TpT store. Get it while you can. 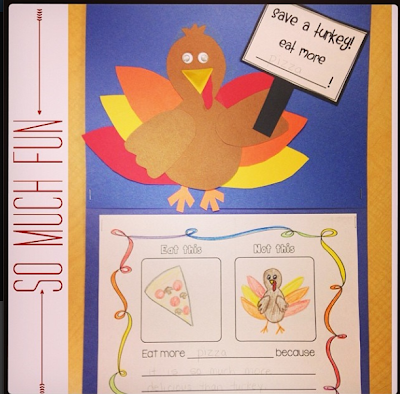 Just a quick recap about Thanksgiving because I updated my Turkeys on Strike activity from last year. First we read The Night Before Thanksgiving by Dav Pilkey. Suuuuuper cute book! Then we worked on these Turkeys on Strike. The kids had to use a little persuasion to get people to choose something else to eat on Thanksgiving instead of turkeys. We had so much fun with these little guys! Click on the picture to get the sign and writing papers if you can use them next year. Moving right along to Christmas, because don't you feel like the absolute second that Thanksgiving was over this year it was time for Christmas. Actually, it almost seemed like Thanksgiving was an afterthought, which is too bad because it really is a great holiday focused on family and not just presents. So, right after Thanksgiving we started our Gingerbread week. Check out this post from last year to get some ideas. Here is a quick little craft we did using the book, The Gingerbread Pirates by Kristin Kladstrup. Another adorable book! 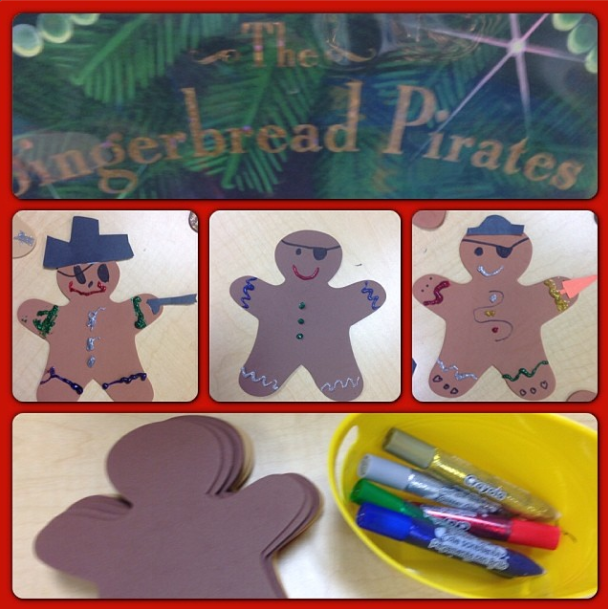 This really isn't anything big, but the kids were SOOOO excited to make a Gingerbread pirate. I am thinking I need to tap into this topic of motivation and make a little pirate unit this year. Add it to the to-do list! In case you're looking for a quick and easy craft, here's what we did. We used those foam cut-outs (I think from JoAnn's or Michael's), glitter glue (which I got on sale on Black Friday), and sharpies. They could choose to make a hat or sword out of construction paper if they wanted, and most of them wanted to. Then I had them write a quick little blurb about the book as a reading response (not pictured). This upcoming week we are doing Reindeer and Elves. Here is some Pinspiration I will be using to make this a fun-filled week. Don't you just love those cookies? I don't think I will be able to pull off the ornament/decoration this year but they are really adorable. 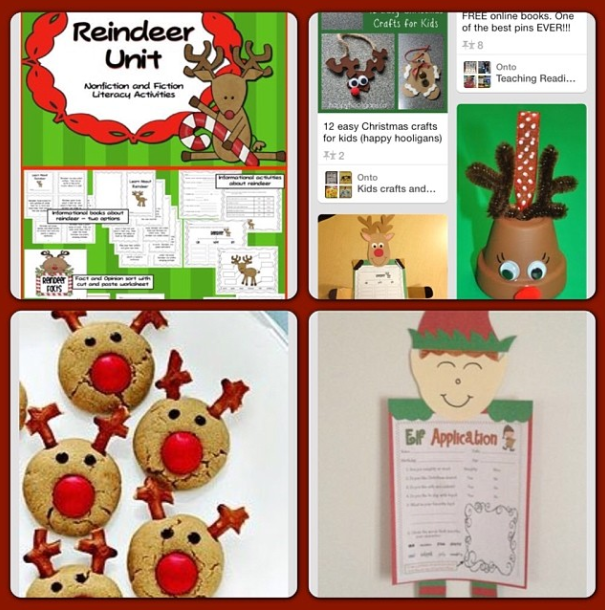 We will, however, be studying reindeer using my Reindeer Unit and going to Elf school using my Elf Elementary pack. Definitely check out Instagram to see some how these fun ideas turn out. Learning about reindeer is always a class favorite (right after pirates I guess). And finally, here is the freebie that I mentioned earlier in this post. This includes a fact family math center and craftivity. I hope you like it! Sorry for my randomness lately, but don't say I didn't warn you with the title of this post.